What Is a Banquet Event Order (BEO)? Venues want to be sure large events go off without a hitch or, if there is a hitch, they want to be sure it's not their fault. With that in mind, they provide carefully crafted Banquet Event Orders (BEOs) which event coordinators must sign. While it might be hard to sue if a BEO is not followed to the letter, it is a legal contract and should be read carefully before it is signed. 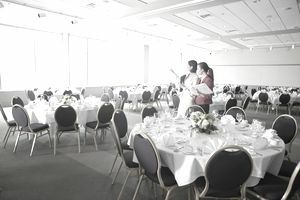 Nearly every major event planned at a hotel or special event facility requires a Banquet Event Order or BEO, which is a contract that outlines every detail of the event. If you're an event planner, you'll want to become familiar with BEOs so that you're able to ensure that all details are covered correctly. The agreement is often outlined on a form that details selections for food and beverage, audio/visual, room setup including table centerpieces, staffing requirements, and all other items relating to your event. Included in the BEO is a broken down list of costs you will need to pay. The agreement most likely includes “blocks” of information under subheadings, such as contact information, schedule, food and beverage arrangements, room setup, audio/visual, terms and conditions, and the signature blocks. While it's obvious you need to read the BEO and agree to the terms outlined in the agreement, make sure also to read the fine print. Make sure you are fully informed as to what you are agreeing to, including all costs. Some BEOs may even include a diagram of the room setup. Audio/visual arrangements will sometimes appear on a BEO, but since many venues contract A/V services to a third party, there may be a separate contract. If it is included in the BEO, make sure all details are finalized before signing the contract. All contracts, including BEOs, have terms and conditions you must adhere to. Make sure you are aware of all terms and conditions before signing the document. For example, what are the terms of the agreement in case of a cancellation? How will disputes be settled if, for example, a guest slips and falls? It's important to ask any questions of the facility manager and confirm details with your client before signing. Once you have signed the BEO, it's a binding contract.